As a well known lover of paper and stationery, I thought I’d do a quick little rundown of some of my very favorite holiday cards this week for those of you who, like me, are still on the hunt for the perfect holiday card. Sure, I had grand intentions of designing my own this year, but somehow life has gotten in the way and it looks as though buying holiday cards may just be the way to go. With that said, it wouldn’t disappoint me in the least to send out any of these letterpress holiday cards and, it has to be noted, my obsession with the awesome Linda + Harriett holiday moose is growing by the second. 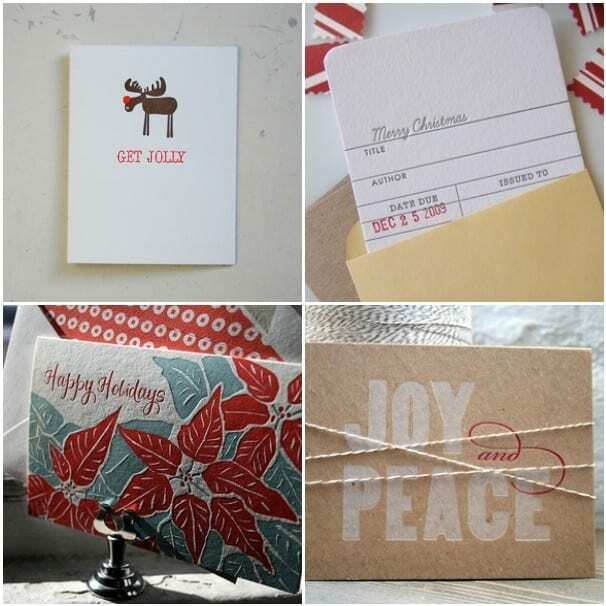 Oh, and anything involving a combination of letterpress, chip board, baker’s twine, library cards, calligraphy, lined envelopes and/or poinsettias is likely to get the thumbs up from me, so you can see why I love all of these cards.